Quora is NOT the next great search engine. Although at first glance you might think that is exactly what it is. No, instead, Quora is an attempt to fill in all the spaces left untouched by Wikipedia. Founded by former Facebook engineers Adam D’Angelo and Charlie Cheever, Quora seeks to tie a question-and-answer format to the social framework of the Web. Joining Quora is as easy as logging in to Facebook or Twitter. In fact, signing in to Quora immediately links these accounts together with your Quora account. The Information Technology Assistance Center is offering a free, online course on “Connecting with Social Media.” This seven-week course begins Tuesday, March 22, and is designed to introduce K-Staters to the fundamental concepts and uses of various social media tools. The course requires pre-registration. Burglaries typically increase during holiday times in Manhattan since criminals know many homes and apartments will be empty, some for an extended period of time. Don’t make it easier for the burglars by advertising when you’ll be gone on Facebook or other social networks. Arrests in New Hampshire earlier this fall underscore the importance of avoiding posts like “Heading home now to spend the holiday with my family. C u next semester, Manhattan” which tell potential burglars exactly when you’re leaving and approximately when you’ll be back. The Information Technology Assistance Center is offering a free, online course on “Connecting with Social Media.” This five-week course begins Wednesday, Nov. 17, and is designed to introduce K-Staters to the fundamental concepts and uses of various social media tools. The course requires pre-registration. If you are based on the K-State Salina campus and you weren’t able to attend the IT Security training provided in Manhattan, now’s your chance! October is National Cybersecurity Awareness Month and, as part of the celebration, K-State’s IT security team is hosting a series of events that will help the users at K-State become more secure. One of those events is the Free Cybersecurity Training Event 1-4:30 p.m. Thursday, Oct. 21, at the K-State Salina Technology Center. The event will consist of a welcome and introductory remarks from K-State’s new Chief Information Officer, Ken Stafford, followed by two groups of breakout sessions. The afternoon will wrap up with a Security Round-Robin, which will be your chance to ask the security experts the questions you have about IT security at K-State. The PowerPoint slides from the June 4 Risks of Social Networking presentation by Harvard Townsend, K-State’s chief information security officer, are now available. To access other presentations, see the IT security roundtables webpage. Social networks like Facebook, Twitter, YouTube, and MySpace are a fact of life (and for some, obsessions! ), especially for the current generation of students at K-State. The reality is if you want to communicate with that generation, you need to have a presence in social media. The other reality is that hackers/criminals know this is where people spend their time and therefore target these platforms. Social networks have also permanently altered the privacy landscape on many fronts — the information we post about ourselves, what others post about us, and the information about you that the social networking sites themselves harvest and perhaps share with third parties. Flipcams are small, but mighty! At the Nov. 5 TechBytes session, Christopher Lavergne, Department of Communications, discussed the use of “Flip Cams in the Classroom”. Flipcams (or Flip Video camcorders) are very small, affordable, and easy-to-use video cameras. Discussion covered how flipcams are a product of viral marketing and allow us to meet the students where they are — on cellphones, YouTube, and other social-networking venues. This enables us to merge education with viral media. Twitter has been all the rage since its launch in March 2006. It’s part of the so-called microblogging phenomena (also known as “micro-sharing” and “micro-updating”), which allows people to offer 140-character messages in virtually real time using this web-based interface (on their computers, laptops, or web-enabled mobile devices). 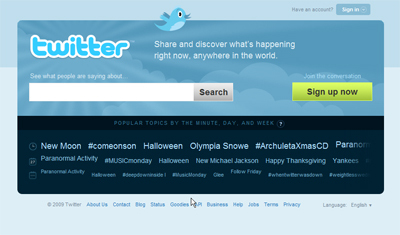 The Twitter homepage may be accessed at twitter.com. TechBytes Oct. 1: What is Twitter? Elaine Edwards will present “What is Twitter?” at 1:30 p.m. Thursday, Oct. 1, in 501 401B Hale Library. (Note the room change.) Attend this session to learn about the Twitter short-message service and how it is currently being used at K-State. TechBytes seminars are free and open to the K-State community. The series is also video-streamed live for off-campus viewers and others who wish to view it from their desktop. Use the “View live video” link on the TechBytes homepage to watch the next live video as it’s being recorded.